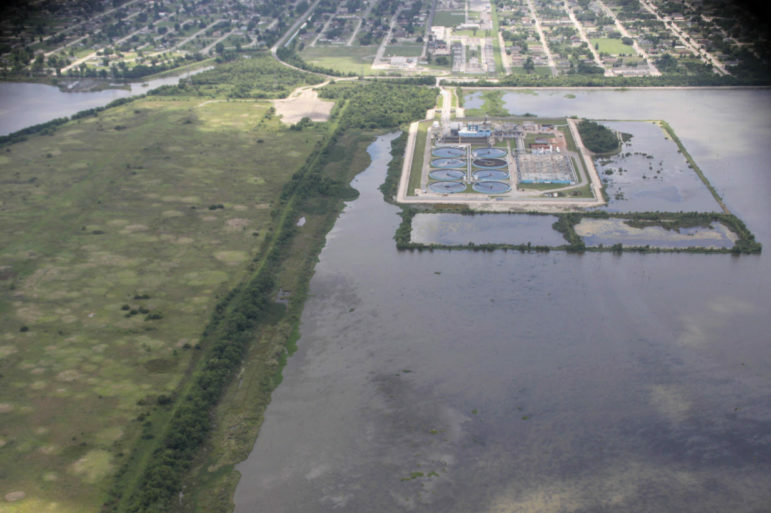 2016 aerial image of S&WB’s East Bank Wastewater Treatment Plant in the Lower Ninth Ward. The demonstration cells are pictured here, directly adjacent to the plant. 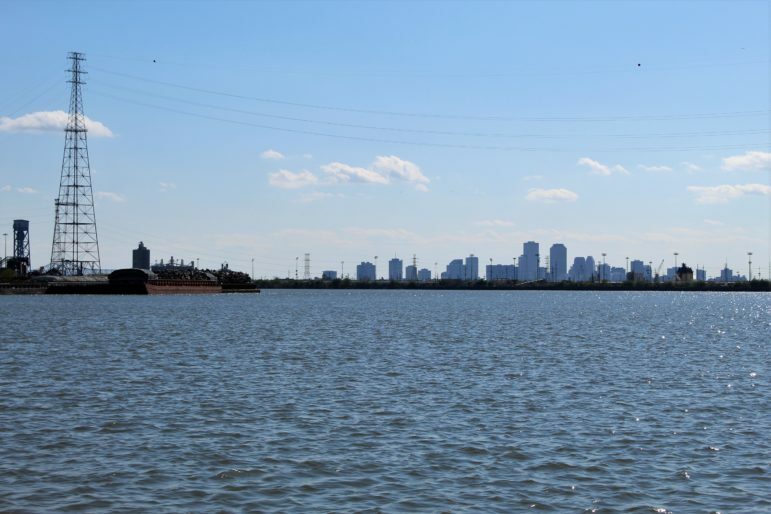 The assimilation project was described at the time as “an innovative partnership between the Sewerage and Water Board and the St. Bernard Parish government to restore 20,000 acres of Bayou Bienvenue,” according to the 2011 press release. Then-Parish President Craig Taffaro attended the groundbreaking with Landrieu and S&WB officials. But in the seven-plus years since then, the S&WB’s assimilation project has been restricted to 14 acres of “demonstration cells” adjacent to the agency’s East Bank Wastewater Treatment Plant in the Lower 9th Ward and another 17 acres in an expansion site next to those. And while a nursery of at least 1,250 bald cypress trees and several thousand other plants were planted in the demonstration cells early last year, no wastewater ever has been discharged to the cells or the expansion area. That’s according to Ann Wilson, the S&WB’s chief of environmental affairs. “Right now, the salinity of the soil in the demonstration plot, as well as the water that is in that plot, [have] low enough salinity for these plants to thrive and they also have enough water for them to grow, as well,” Wilson said. She said the S&WB has a permit from LDEQ to discharge no more than 144,000 gallons of water a day, and only into the 14-acre demonstration cells. It’s just never used that permit. The S&WB has also applied for a second permit for the 17-acre expansion site, she said. “We’re eagerly awaiting our discharge permit from the state to authorize this second discharge” into the expansion area, Wilson said. “And we anticipate the discharge to be the same as the demonstration cells, approximately 144,000 gallons of treated wastewater per day. Again, we would not discharge into Bayou Bienvenue Wetland Triangle,” but rather a small area directly adjacent to the plant. That amount of water is truly a drop in the bucket. 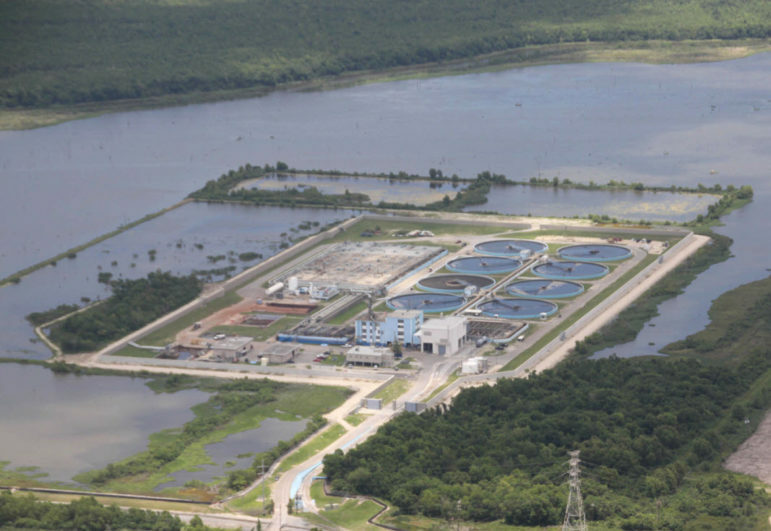 The East Bank treatment facility is permitted to discharge up to 122 million gallons of wastewater after treatment into the Mississippi River, each day. 2016 aerial image of S&WB’s East Bank Wastewater Treatment Plant, located in the Bayou Bienvenue Wetland Triangle. Instead of wastewater, the newly planted cypress trees and other vegetation have been well watered by rainfall and protected from saltwater by a berm around the demonstration cells. As for why it has taken so many years to get to even this early stage in the project, Wilson cited a few factors. In 2011, S&WB projected the total cost of the project at $65 million, though that included St. Bernard Parish’s part of the project. Funding including $10.4 million in grants from the state and the Delta Regional Authority. Between 2007 and 2017, the agency spent $8.9 million on the project, financial records show. Everything needed to begin assimilation discharge is place now, Wilson said, apart from the LDEQ permit for the expansion site. The permit for the demonstration cells expired about five years ago but has been “administratively continued” by LDEQ, allowing discharges there to go forward pending agency action to renew the permit. LDEQ told The Lens in March that permit renewal was in process. And even now, S&WB is in no rush to begin discharging. Another delaying factor has been St. Bernard Parish’s withdrawal from the joint project, Wilson said. St. Bernard Parish has been permitted to discharge treated wastewater into the Poydras-Verret Wetland since 2003. Parish officials did not respond to repeated requests for comment. Wastewater assimilation is under fire from some residents and conservation groups, who say it has further damaged wetland sites and lessens the ability of those wetlands to offer storm surge protections. The La. Department of Environmental Quality, one of the agencies that regulate these assimilation systems, has said it is reviewing all of the projects across the state. A particular study has been commissioned to focus on the City of Hammond’s assimilation system, which discharges south of Ponchatoula at the edge of the Joyce Wildlife Management Area. After years of saltwater intrusion, open water covers much of the once-wetland area of Bayou Bienvenue. The S&WB’s environmental chief insists that, whatever the means for it, wetland restoration around Bayou Bienvenue remains a worthwhile goal. In addition to storm surge protections, Wilson cited the potential for new recreational opportunities in the area as well as new wildlife habitats. Lens editor Charles Maldonado contributed to this report.